Werner Herzog in spirit sequel to the 1992 film Bad Lieutenant is a trippy, darkly humorous, detective story with Nicholas Cage’s Terrance taking us on a wild ride into depravity that we can’t really predict. During the mayhem of hurricane Katrina Terrance and his partner watch a prisoner trapped in a cell as the water is slowly rising around him, Terrance decides to jump in and let him out only to hurt his back and when we pick up again a few months later, the man has grown addicted to pain pills and seems to have much more of a problem beyond that. Upon investigating a homicide in which an entire family is murdered over a drug turf dispute, Terrance becomes involved in a case that deals with a top drug lord, Big Fate, and between his desire to close the case and battling his own demons Terrance ends up having to juggle a lot of risks to try and come out clean with Big Fate in jail on the other side. Now, Werner Herzog isn’t afraid to take us anywhere, we get involved with gangsters, bookies, gambling debts, drug dealers, throwing games, police brutality, witness murders, dirty cops, cocaine, heroin, and just about any drug you can imagine you are going to touch it all. And with that in mind, it gives the film a feeling of uncertainty in what is going to happen next and it is almost kind of fun/scary to watch where Terrance will end up next. 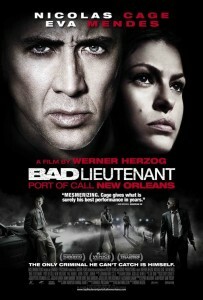 The film’s style is pretty down and dirty and that lends itself to the setting which is in post-Katrina recovery New Orleans and the disheveled film style works quite well with disheveled nature of the city. The film is also not afraid to be bad and have a laugh at its expense. The film is bound to offend the weak hearted, the morally strong, and anyone who can’t find humor in a potentially unsettling scenario. The plotting on the film is also quite sharp and cleverly comes together as we see how smart Terrance is and why he is considered his department’s best detective. Terrance himself is such an interesting character to follow on his own the film could be plot less and he would be fun to watch for ninety minutes just running around randomly doing what he does. Some will complain that things might be a tad to convenient in the end, but that is part of the fun of it all and what makes a movie like this fun in that it all comes together. Nicholas Cage is fantastic as Terrance and really carries the picture with ease and turns in one of his best performances in years. From the drug use, to the trippy hallucinations, to the conniving and conning, and his incredible physicality make us believe Terrance’s pain in his back and the problems it causes. That manic nature that Cage plays so well lends itself perfectly to the character and makes lines like, “shoot him again, his soul is still dancing,” not only work but hilarious as well. Val Kilmer plays Terrance’s ex-partner and while he isn’t in the picture a whole lot he is delightful as usual as a crooked detective. Eva Mendes is good as Terrance’s girl who also happens to be a high end prostitute but never gives off a trashy or sleazy vibe to her character; she is very honest in her portrayal of a woman who is in love with Terrance for both the man and his drug supply. Jennifer Coolidge is also very good as Terrance’s father’s girlfriend and plays completely against her type and does her best dramatic work in ages. Xzibit is also a lot of fun as the drug dealer, Big Fate, and makes the most of his screen time and works well with Cage. 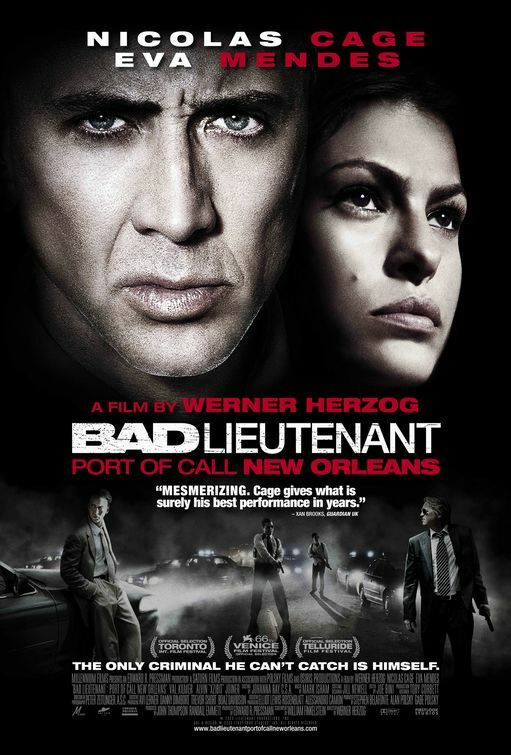 In the end, The Bad Lieutenant: Port of Call – New Orleans is a crazy and depraved detective story that juggle morals and has a hero that is addicted to an assortment of drugs and is a dirty cop. He might not be the worst person in the film, but he certainly isn’t the nicest either and that is sure to rub many the wrong ways. With that said I had a blast eating up the dark humor and the oddness of it all and had a tough time figuring out where we were going to end up next as we dive deeper and deeper into the underground crime scene with Terrance. A film not for everyone, but there is a lot to like for those that enjoy dark off the wall pictures and this one even has a pretty good detective plot going for it as well.